Gov. Ricardo Rosselló says President Trump is aware of the magnitude of the damage Hurricane Maria caused Puerto Rico. Puerto Rico Gov. Ricardo Rosselló confirmed Tuesday he spoke to President Donald Trump about the magnitude of the devastation to Puerto Rico in the wake of Hurricane María, confirming it could reach $95 billion. 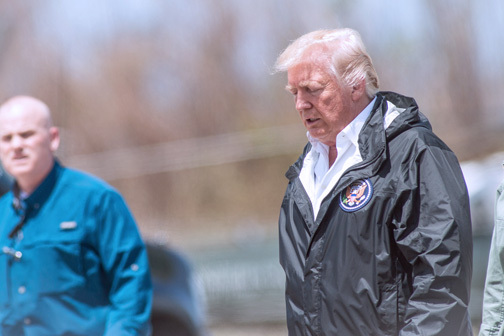 In a news conference after Trump’s brief visit to the island — during which he met with military officers and hurricane victims, and flew over ravaged portions of the island along the mountains and the northeaster — the governor said he is asking the U.S. government for specific actions to aid in the recovery. First, he said, Puerto Rico needs to get supplemental help under the U.S. Department of Housing’s Community Development Block Grant Program, additional funding under Medicaid and expanded access to federal grants and loans. His comments came after earlier in the day, during a briefing at the Muñiz Air Base in Carolina, Trump said Puerto Rico had thrown the budget “out of whack” and seemingly downplayed the extent of Hurricane María’s damage to Puerto Rico. 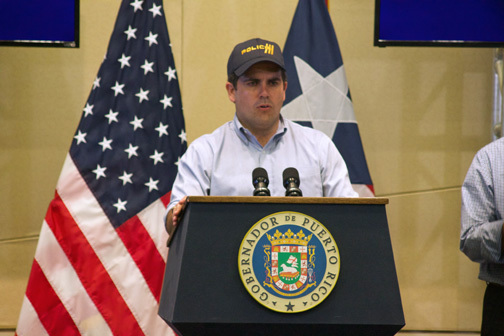 Rosselló said he stressed the need to address the impending Medicaid cliff in 2018, when healthcare funding to Puerto Rico is expected to drop to $350 million from the current $1.6 billion available under Obamacare. “Our request right now is that we get immediate, sustained levels of funding for Puerto Rico under Medicaid. Hospitals and healthcare will be a challenge that will continue in the short, mid and long term,” the governor said. “Rehabilitating a system that was crippled by the storm will not happen overnight and we’ll need capital to restore that hospital network and make sure that the people of Puerto Rico can get back on track,” he added. The governor also asked for permanent waivers of certain components available through the Federal Emergency Management Agency, and getting full access to all loans and grants available under all federal agencies, to help in the rebuilding phase. “The heads of the national agencies also participated in conversations we had to see how their agencies could collaborate with their analogous agencies in Puerto Rico,” Rosselló said, adding he also filed a petition to have access to equipment and personnel to fix Puerto Rico’s electrical grid. Business reporter with 25 years of experience writing for weekly and daily newspapers, as well as trade publications in Puerto Rico. My list of former employers includes Caribbean Business, The San Juan Star, and the Puerto Rico Daily Sun, among others. My areas of expertise include telecommunications, technology, retail, agriculture, tourism, banking and most other areas of the economy. Hey Buddy!, I found this information for you: "Rosselló: Damage to PR could reach B, Trump aware". Here is the website link: https://newsismybusiness.com/rossello-damage-trump/. Thank you.